Group of five wooden beams with glass panels. Inside the toppled beams, text is written on the glass panels. Il n’y a pas de commencement. Working in association with the Teknograv glass workshop, Atelier Pierre Thibault presents La forêt, an installation that takes a sensitive and poetic approach to the environment and its exploitation. Here, wood is presented as an element for architectural construction, while glass is used as a medium to capture light and reconstruct words. 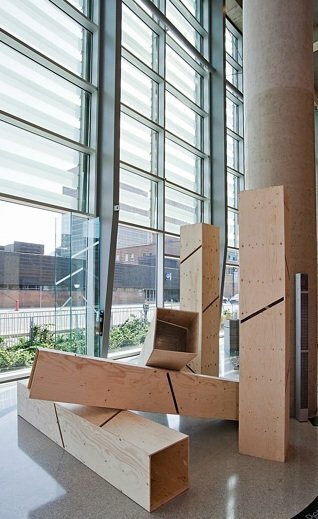 From May 18 to October 31, 2010, in the entrance hall of the Grande Bibliothèque, Bibliothèque et Archives nationales du Québec (BAnQ) will be hosting the exhibition Architectures en vers, which consists in five architectural installations inspired by poetry. These installations were created by collectives of well-known and up-and-coming architects working with glass artists. The exhibition is presented as part of the “Montréal, 2010 City of Glass” program, under the direction of the Board of Montreal Museum Directors. The chosen verses are from author Hélène Dorion, from the collection D’argile et de souffle, published by Éditions Typo (2002).